NEW YORK, Sept 3 (Reuters) — Children still skip rope and play pickup ballgames, but today’s parents also organize playdates, fitness lessons and gym classes to keep their kids active and safe. Almost 17 percent of U.S. children and adolescents were obese in 2009-10, according to the Centers for Disease Control and Prevention. Many adults willingly suffer to banish love handles, but children insist on having a good time. So making fitness fun is key, experts say, along with starting early. Just as learning a language is easier when it is started as a child, the same is true for movement, according to Faigenbaum. Total body movements, as in dance and martial arts are ideally suited to young children, he added, especially when performed under the guidance of an instructor who can connect with children. “Those are skills children can carry over for life,” he said. Jodi B. Komitor, a former elementary school teacher and the founder of “Next Generation Yoga,” teaches yoga to children starting at 18 months. “Children learn through movement and yoga is a movement-based science that’s been around for over 5,000 years,” said Komitor. 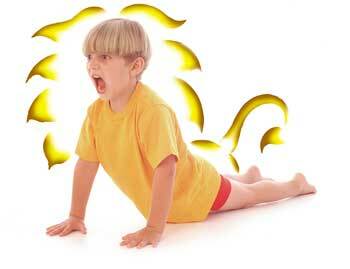 “A lot of parents tell us their kids start doing downward dog naturally,” she added, referring to the yoga pose. Komitor designed her first studio for kids’ yoga, in New York, after the Wizard of Oz. 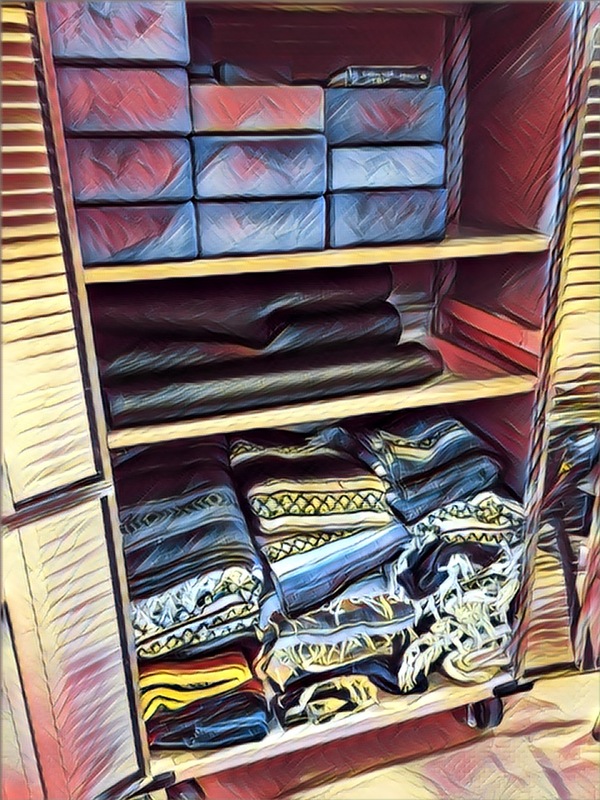 Unlike adult yoga sessions, which cultivate quietness, her children’s classes are often noisy and always age-specific. Classes have a foundation of yoga poses and incorporate playfulness and self-expression. Much as Zumba, the Latin-based dance/fitness craze, purported to hide the fitness in the party, Zumba CEO Alberto Perlman likes to say that Zumbatomic, the dance classes designed for kids ages four to 12, hides the medicine in the candy. “With younger kids class is not only about fitness but also about developing motor skills,” said Perlman. Ashley Walters runs the Kid Action program at Streb in Brooklyn, New York. The program, based on the choreography of founder Elizabeth Streb, intertwines dance, athletics, boxing, rodeo and circus skills. Faigenbaum believes that movement training should begin at the preschool level. At seven or eight the child is usually ready for sport and some strength conditioning. He added that research shows that children who have developed their motor skills, such as throwing, running, kicking, hopping, twisting, are more likely to be remain active as adults. “The obese child is likely to become the obese adolescent,” he added. Although children may not want to follow mom and dad to the gym, experts say youngstgers still need at least 60 minutes of moderate to vigorous physical activity a day, every day. He urged parents to take an activity history of their child. 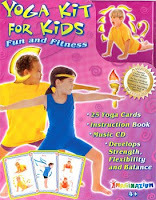 Yoga Kit for Kids. A set of cards, Music for Yoga in two tracks of 20 minutes. A handbook telling about the poses, the benefit of yoga for kids. This Kit is setup for one to take to a school environment. I tell you, Grace and I had fun with this. Can’t believe she is only 3 years and 10 months old. Take a look! Here is grace doing Shark Pose (like in the yoga card demo). And here are a few other poses that Grace enjoyed!! Butterfly, Candle, Cat, Fish, Cat with raised leg, Flower, but looks like Turtle and Down Dog! 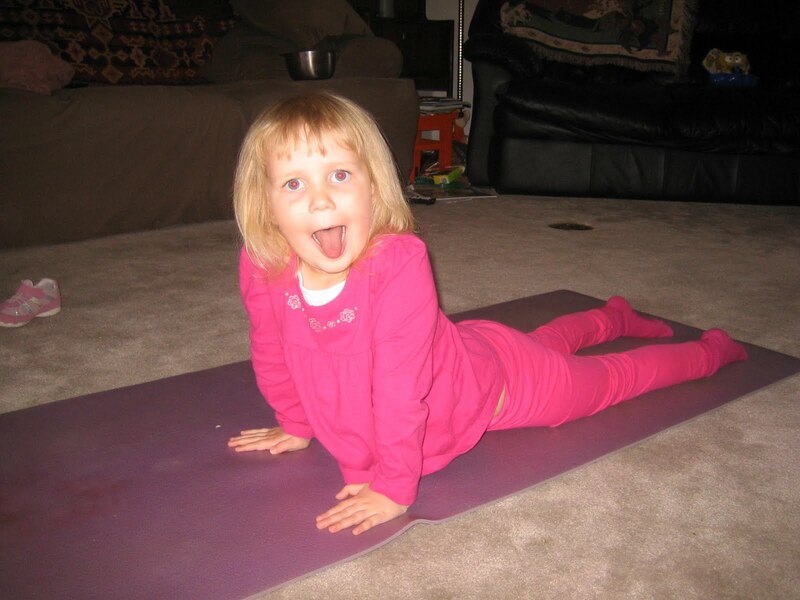 http://inevergrewup.net/giveaway-9-start-yoga-with-your-kids/ for yoga for the kiddos!